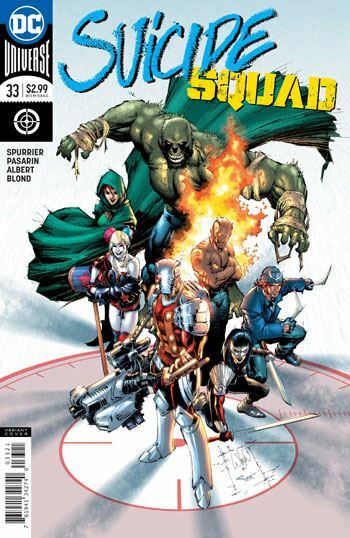 Si Spurrier takes the reins of the Suicide Squad, and launches his run with a relly fun story. Pasarin and Albert do the art on this story, and do a great job of it. 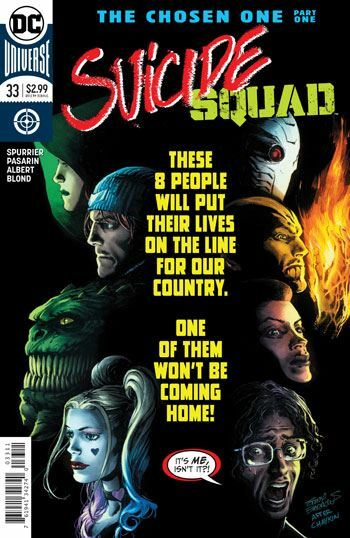 The cover plays off of the cover of the first issue of the Ostrander Suicide Squad, but the story is very different. This issue is all told from the point of view of a new character, a guy who accidentally gained the power to open all locks, with nanites in his hand. He attempted to join the Justice League, but was rejected, and eventually his abilities proved more useful for crime. That career did not pan out well, though, and he wound up in Belle Reve. After being forcibly volunteered onto the Squad by Amanda Waller, he takes part in the latest mission, as cannon fodder. The poor guy’s certainty that he is going to die is highlighted on the cover, and plays out throughout this issue. A minor spoiler here, he does not die in this issue. And he shouldn’t. He is just too much fun. The rest of the Squad are shown, but largely from the man’s perspective, and only have small roles in the tale. Still, most of them get good moments along the way, and Spurrier looks like he has a good sense of how to handle them. As always, I will wind up bitching if this book continues to avoid the political elements so important in Ostrander’s run, but so far it looks like we are in for some fun villain action coming up.